My parents have recently installed a baby gate to keep our elderly cat confined to a safe area of the house. My Tibetan Spaniel does not approve of any barrier between him and filling his belly with mushy cat food. 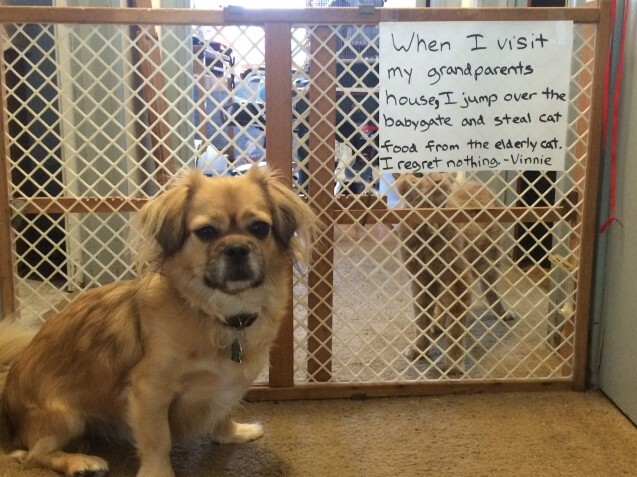 Vinnie has spent most of the last 5 visits whining and crying in front of the baby gate, climbing over it, and trying to eat all the cat food before he gets caught. Posted February 15th, 2017 .